All you can see at the Nugget Campground is mountains and sky. Visit our campground nestled in the majestic Montana mountains. If you enjoy the great outdoors, we have it all! Gateway to Flathead Lake, Glacier National Park, Waterton Lakes and the National Bison Range. The campground includes 90 sites on a majestic mountain setting, 20-30-50 amp service and long pull-throughs, camping cabins, heated pool and playground with authentic fort. 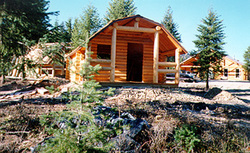 Has mountain hiking trail that starts right at the campground. Deer, elk, and wild animals can be seen often. There is a new golf course just across the road and a golf driving range at camp. Also, the new Foxhole Tavern and Casino. We also offer Good Sam Club discounts. Directions: The Nugget Campground is located 1 mile east of St. Regis on Frontage Road. Go 1 mile east of St. Regis 4-way stop. Exit 33 off I-90 to St. Regis.